Costco is one of my favorite places to shop, as I’ve written here. But since my angioplasty, I’ve been severely disappointed at the unhealthiness of its food court offerings. I can no longer eat the hot dogs I once did, too much fat and salt. Same for the giant slices of Costco pizza. And even the Costco turkey sandwich, which you might think was healthier, is loaded with fat and salt, far too much for me. So after my usual Thursday night Costco shopping run, I normally have only a frozen fat-free yogurt and a Costco food court salad — with some major alterations. I recently came across a post talking about how unhealthy that Costco food court salad is. “This jacked-up salad has more calories, total fat, cholesterol and sodium than either the Kirkland Signature All Beef Hot Dog or Polish Sausage,” writes the Tasty Island blog. 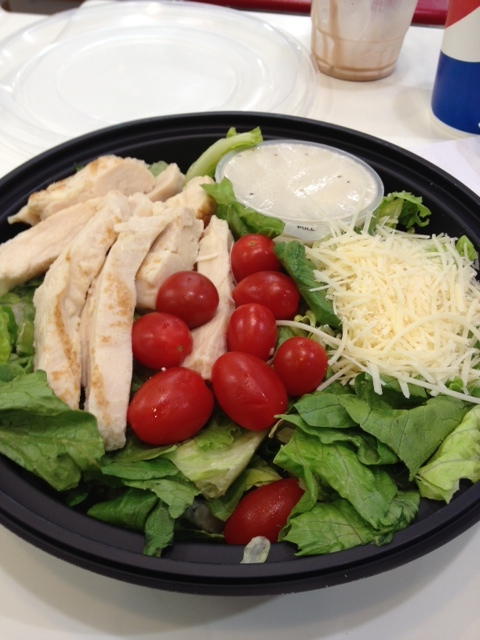 The fat is in the dressing, of course, and the cheese and croutons that come with the salad. If you eat all that, the salad has 40 grams of fat and 2,680 mgs of sodium, about two days worth of salt for me, or for you if you’re dealing with blood pressure or heart issues. “As for the salad, substitute the OEM Caesar dressing for an Extra Virgin Olive Oil-based vinaigrette dressing and take out some of the parmesan cheese and croutons, and it obviously will be far better for you than the hot dog. But who’s going to do that at the convenience of Costco’s Food court? Not me, that’s for sure,” writes the Tasty Island. 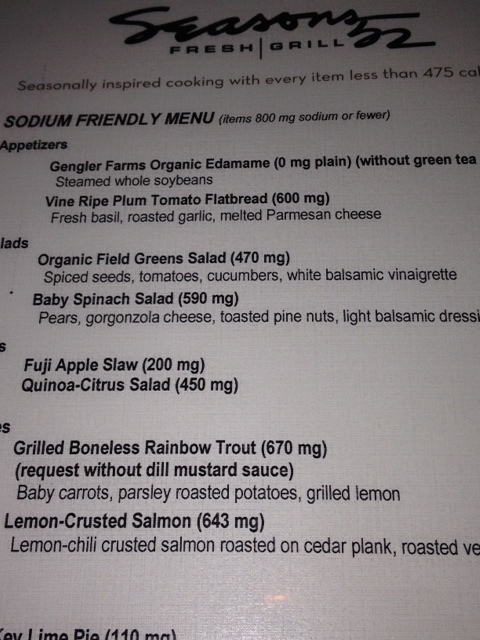 Seasons 52 offers a low sodium menu…bravo! Seasons 52 is a relatively new restaurant chain headquartered in California but with restaurants across the country including here in the Chicago area. It bills itself as “A fresh dining experience that celebrates living well” and trumpets that no individual item on its seasonally inspired menus has more than 500 calories. We’d been there before and enjoyed it, but that was before I was ordered into my current low-sodium, low-fat, low-sugar diet, so I wasn’t sure what to expect on our latest visit. Seasons 52 offers a low-sodium menu. Bravo for doing that, keep expanding it please. 27 Live is a new restaurant, whiskey lounge, music venue hybrid in Evanston, the Chicago suburb where I live, that’s worth checking out for its food and ability to accommodate a low-salt dinner request. I was interested in seeing what the operators of 27 Live had done with the space they have. For many years, it housed a Carmen’ pizza place in a cavernous two-story restaurant complete with big staircase and upstairs bar and party area where I spent many an end of the soccer season when I was coaching my son’s AYSO teams years ago. Carmen’s was always a family favorite, even after it downsized a few years ago, turning over part of its space to a Brazilian steakhouse I never got to try out. 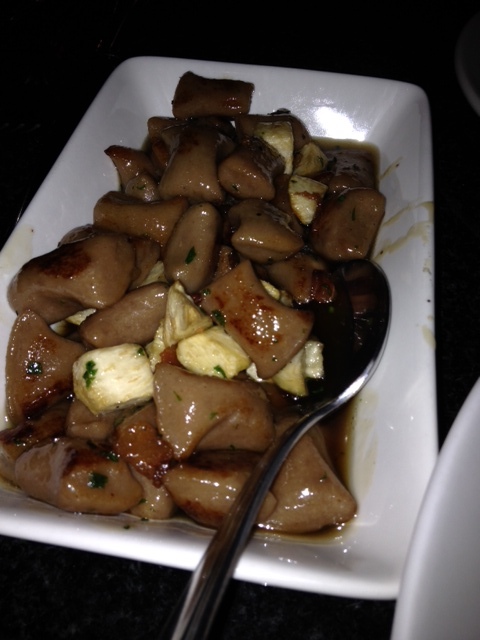 Chestnut gnocchi in a brown sugar and bacon sauce was amazing at 27Live. Chocolate pudding is something I’ve enjoyed since I was a young child but of course it now has all the things I can’t eat, namely fat and sugar. 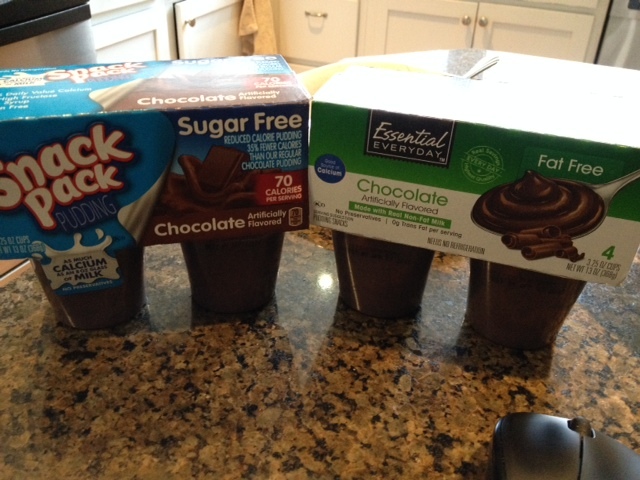 So I’ve been searching through pre-made pudding alternatives to see what’s out there. Oddly enough, there are fat-free chocolate puddings and sugar-free chocolate puddings but no fat-free, sugar-free varieties that I can find. So if I want chocolate pudding these days, it becomes a matter of which do I fear more, eating a lot of sugar or a lot fat? Fat free pudding or sugar-free pudding? Which would you pick? I would substitute Mrs. Dash sodium free teriyaki marinade for the soy dressing and sodium-free chicken broth (which I’ll be blogging about soon) for the low-sodium broth to get the salt out. Also be sure to get the leanest white meat-only ground turkey to cut fat. Sounds yummy. Which new food products were the hottest sellers of 2013? Interestingly enough, products that offered some health benefit topped an annual list put together by Information Resources, Inc., a firm that tracks supermarket checkout data. 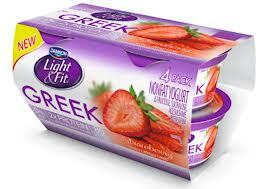 Dannon Light & Fit Greek yogurt was the top selling new food product of 2013. “Among food and beverages launches, seven of the top 10, and 73 of the top 100, as ranked by total first-year dollar sales across grocery, drug and mass retail formats, offer a “healthier for you” benefit,” reported Marketing Daily in detailing IRI’s results. So how healthy are these? Many yogurts have too much sugar. Anything more than 10 grams is too much. The top two here are light varieties, which means they have less sugar but you have to ask yourself how you feel about whatever sweetener is put in them instead. Cereals and chips generally have too much salt and can be loaded with fat as well depending on the product, check all nutrition labels, always. Frozen meals generally have too much salt. Pepsi Next is a lower calorie cola which again raises the issue of how you feel about the sweeteners used to get the calories out of the drink. All in all, not a very healthy list. Don’t be fooled by health claims, look at salt, fat and sugar content before buying any new food product. How much salt is too much for you to eat? General guidelines these days say 2,300 mgs for normal people and 1,500 mgs for those with heart or blood pressure issues (i.e. me) or people 51 or older. So how do you translate that into meals, especially meals eaten away from home? My rule is to try to stay under 1,200 mgs a day since I assume measurements on packaged products or for restaurant nutrition menus can be off a bit. That translates into 400 mgs a meal. That’s for a meal, not a single part of a meal like a turkey burger or side dish like broccoli or whole wheat pasta. Sliced meats like this are a no-no on a low-salt diet. Even reduced salt varieties have more salt than you need at one meal. Well put, I’ve written many times that you shouldn’t be fooled by claims of ‘healthy’ on products. 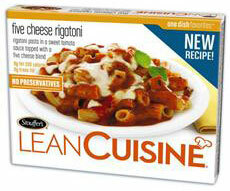 Lean Cuisine began as a line of frozen foods that supposedly was healthier than other frozen offerings because it had fewer calories. But I’ve always avoided them because of the massive amounts of salt they, and all frozen offerings, contain. So I was happy to see an old colleague writing about the salt issue in a recent Bloomberg story about Lean Cuisine and the marketing troubles it’s been having of late. Lean Cuisine, just say no to the salt and make your own dinner.